Every Monday we hope to share a quick food prep Sunday post. Mary and I both like to get a tackle on the week before it even starts and it usually begins in the kitchen! This week’s food prep was a bit unique since I’m hosting my first real Thanksgiving with my family on Thursday! Side note: I am so nervous! Actually planned out when I could make all the food for Thanksgiving and a schedule for the few days leading up to it. I plan to make as much of my green bean salad as I can before cooking it on Thursday, making my pumpkin pie and biscuits the night before and brining the turkey too. I purchased Danielle Walker’s Thanksgiving eBook for most of my recipes this year! Like I said, not as much prep as usual but I’ll be cooking way more than I normally do throughout a week. I thought I’d share my menu/grocery list template that I use for food prep today! You can download the PDF here. I have each day listed for you to plan dinner. Then at the bottom I have lunch and breakfast ideas since I don’t usually plan a different breakfast and lunch each day. This week I plan on making sweet potato hash/egg, tuna or eating banana bread Monday-Wednesday. 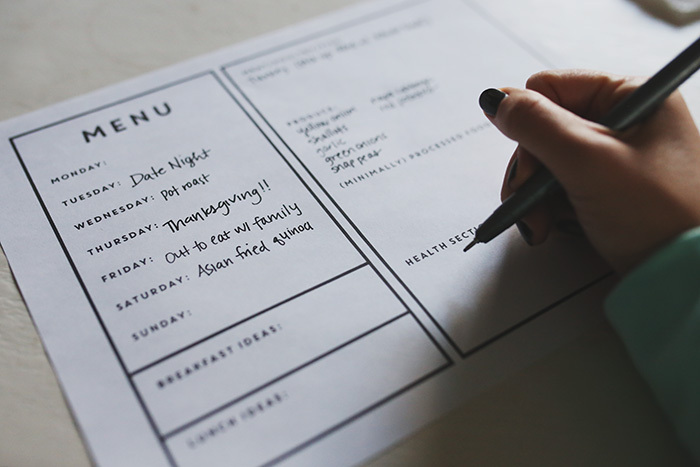 As you list out your meals, you can add the ingredients over to the right hand side of the sheet. I list meats/poultry/fish and produce at the top. Minimally processed foods like kettle chips, cheese or pumpkin puree can go below that. Then I leave two smaller spots for our Kroger’s “healthy section” and miscellaneous. I tend to get things like coconut milk, almond milk, eggs and raw nuts in the healthy section. I leave things like poultry seasoning, paper towels and anything random for the misc section! Are you planning for a Thanksgiving meal this week? Traveling? How do you handle meal planning around the holidays? I am flying back East for Thanksgiving, thankfully it’s a direct flight. I will be the meal maker so I emailed my Ingredient list to family back home. This way I will have everything I need to prepare my Thanksgiving feast. Typing out that email helped me organize my thoughts. Luckily, I hosted a Friendsgiving last Friday, so I made all my mistakes then and can avoid not seasoning foods enough. Oh that’s awesome!! I think planning out my schedule for Wed/Thurs made me feel more in control but I’m making almost ALL new recipes (never made them before) so that makes me nervous :( I wanted to host a Friendsgiving but didn’t want to get burnt out either. Any tips? This is great! Thanks for that pdf download. I’ve been meaning to plan my meals lately and this is just the inspiration I needed. I love hearing that!! Thanks for reading, Stephanie! Thank you so much for this lovely download! I’m a new follower of your blog and can’t wait to read more (plus I’m always looking for new ideas/inspirations to get me cooking healthily!) Thanks for sharing. Thanks for finding us and so happy you love the download!